All Web addresses mentioned were functional as of 4-8-16. From the Cumberland Gap to the Atlantic Ocean, this is Virginia Water Radio for the week of April 11, 2016. This week, those sounds above and below the surface of the Appomattox River open a replay of an April 2014 episode about signals on and in Virginia’s water bodies. Have a listen for about 10 seconds to the following mystery sound, see if you can guess what group of water-resources users this sound is designed to alert. And here’s a hint: it’s a powerful signal, for reel...and rod. If you guessed, a signal for people fishing, you’re right! You heard a June 2013 recording of a warning siren at the Claytor Lake hydroelectric facility on the New River in Pulaski County, Virginia. The Claytor facility’s staff calls that siren its “fisherman warning signal” and uses it to alert anglers and any other nearby river users that a power-generating unit is about to start operating and releasing more water. 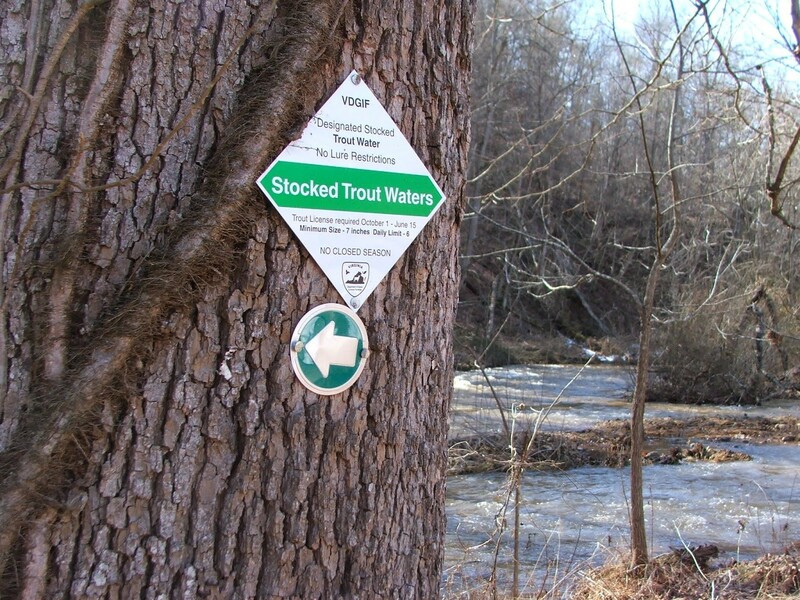 While that siren is a human-generated signal to stop fishing, spring in Virginia sends out plenty of natural signals that it’s time to start or increase fishing activity. Anglers follow fish, and fish follow various environmental and biological cues, such as temperature, daylight, sources of insects and other food, predator behavior, and life-cycle demands. Spring brings significant changes to those fish cues, and as a result, gives many anglers their cue to resume trying to outwit the finned inhabitants of the Commonwealth’s ponds, lakes, streams, rivers, and coastal waters. As a musical tribute to that perennial battle of wits, we close with about 20 seconds of “Bass Fisherman’s Reel,” courtesy of Williamsburg musician Timothy Seaman. This week’s episode is a slightly revised and updated replay of Episode 208 (4-7-14), which has been archived. The underwater sounds in this episode were recorded by Raven Harris, of Newport News, Va., on the Appomattox River in Petersburg, Va., on April 18, 2014; used with permission. The “fisherman’s warning signal” was recorded by Virginia Water Radio on June 30, 2013. “Bass Fisherman’s Reel” is on the 2004 CD “Virginia Wildlife,” copyright Timothy Seaman and Pine Wind Music, used with permission. This music was featured in Virginia Water Radio Episode 73, 8-1-11. More information about Timothy Seaman is available online at http://timothyseaman.com/. Virginia Department of Game and Inland Fisheries (VDGIF) sign indicating a trout-stocking area on Cripple Creek along Rt. 641 in Wythe County, Va., February 22, 2014. Fish nest in Toms Creek in Blacksburg, Va., (Montgomery County), May 8, 2010. 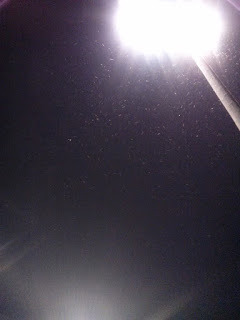 A signal for fly-fishing anglers: adult mayflies swarming around a ballfield light in Shawsville, Va. (Montgomery County), near the South Fork Roanoke, River, May 12, 2014. Information on the fisherman warning signal at the American Electric Power (AEP)/Appalachian Power (APCO) Claytor Hydroelectric Facility, located on the New River in Pulaski County, Virginia, was provided by Elizabeth Parcell, a process supervisor at the Claytor Lake facility, in a 7/16/13 e-mail. More information about the Claytor Lake facility is available from AEP’s Web site for the facility, at http://www.claytorhydro.com. Information on freshwater fishing in Virginia—including kinds of fish, places to fish, fishing seasons, and regulations—is available in the “Virginia Freshwater Fishing and Watercraft Owner’s Guide,” published annually by the Virginia Department of Game and Inland Fisheries (VDGIF), online at http://www.dgif.virginia.gov/fishing/regulations/. Information on recreational saltwater fishing in Virginia (including information on regulations and permits) is available from the Virginia Marine Resources Commission (VMRC), online at http://www.mrc.virginia.gov/recreational.shtm. An ongoing source of information on freshwater fishing and other outdoor activities in Virginia is the VDGIF’s “Outdoor Report,” available online at http://blog.wildlife.virginia.gov/outdoor-report/. All Water Radio episodes are listed by category at the Index link above (http://www.virginiawaterradio.org/p/index.html); see particularly the “Fish” and “Recreation” subject categories.